'I have found Sally Raymond's worksheets ideally suited for use with pupils in need of focussed literacy development materials. They find them varied and accessible with opportunities to include personal interests and topics. This A4 resource book provides all the materials required to follow structured programmes of learning support for dyslexic pupils. Created by Sally Raymond, an experienced teacher of dyslexic pupils, this resource provides a wide variety of adaptable worksheets with lots of teaching advice and supportive guidance. 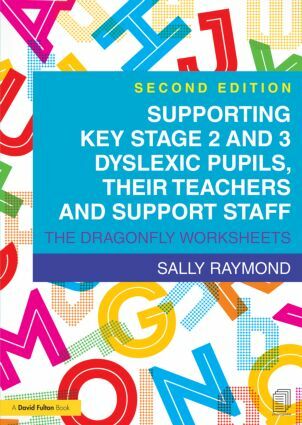 Introduction; Meeting the needs of dyslexic pupils; Support throughout the curriculum; Processing weaknesses found within the dyslexic profile; Organisation of delivery; The Dragonfly Worksheets. Sally Raymond DipSpLD(Hornsby), PGDip(SEN) is an experienced dyslexia tutor and trainer living in Cornwall.